It is the smallest province of Tuscany, with the second largest city of the region, Prato. But, in spite of its dimensions, in its territory we can find some enchanting medieval villages, such as Poggio a Caiano or Carmignano, of Etruscan origins. 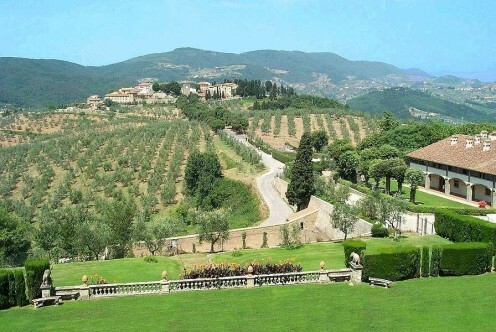 The hills surrounding these villages are beautiful and rich in charming Tuscan holiday homes. Its proximity to Florence, makes this area one of the most sought-after by tourism and the various offers of Tuscan accommodations in the area can satisfy all kinds of guests. The town of Prato, set at the foothills of the Apennines, on the right bank of the Bisenzio River, is an outstanding crossroads. Thence its significant position in the region. It has been for centuries an economically great dynamic and culturally vivacious centre. Its modern aspect, due to the industrial textile development, dating back to the Middle Ages, well matches with the medieval and renaissance traits. The origins of the town are still not completely clear. Maybe an Etruscan settlement, a Roman village, probably named Cornius, then the 10th century first written references which establish the existence of a hamlet "Borgo al Cornio" near the present Cathedral of Santo Stefano. Between the end of the 12th and the beginning of the 13th century, two subsequent defensive walls were built around the city which would become so important for wool trading. After a relatively stagnant period, the 18th-century Florentine influence of the Lorena family further encouraged Prato's textile activity and its subsequent modern development. The 19th-century industrial mechanization improved the typical production of recycled wool from textile waste. These products paved the way to the foundations of its present leadership in the sector. In the 20th century, more exactly in the 60s, substantially renewed technologies together with the use of regenerated raw-materials and of valuable fibres (virgin wools, cashmere, silk, linen, cotton, viscose) has gained Prato a world-wide leadership, basically appreciated by the "Made in Italy" stylists. The city certainly deserves a tour. Let's start with Piazza del Duomo, the area of the first urban settlement and the location of the most representative monument: the Cathedral of Santo Stefano, one of the most finest example of Tuscan Romanesque style, characterized by the alberese limestone and the green serpentine. Its 13th century bell tower, with its external pulpit by Michelozzo and Donatello, is used for the display of the Holy Girdle to the faithful, very attached to it, as a precious Marian relic and as historical symbol for the textile industry which marked the history of the town's economical growth. The original structure of the Municipal Palace little retains of its medieval form. Nowadays it houses the Museum with a collection of great masterpieces by Bernardino Daddi, Filippo Lippi and his son Filippino, who was born in Prato. The character of the city is better symbolized by Palazzo Datini, an exceptional merchant and writer who first introduced in Europe the bill of exchange. His private papers, now housed in the building, are a great source for the historical background. At the end don't let us forget the taste for experimentation at the Centre for Contemporary Art Luigi Pecci, a sure reference point for contemporary art in Tuscany. Deep in the Tuscan countryside, set in a 700-hectare estate of olive trees and vineyards lies this Hotel Villa in Chianti. The complex offers sports facilities, restaurants and beautiful, panoramic views. Hotel Paggeria Medicea overlooks Florence (a 40 minutes’ drive away) from its hilltop position. The building dates back to the medieval Medici period and maintains its old stone and wood-based décor. Rooms are rustic in style and come with satellite television and free Wi-Fi internet access. Some even have their own Jacuzzis. On the estate surrounding this Bed and Breakfast you can go for a swim in one of the 2 pools, explore the countryside on one of the hotel’s bikes or enjoy a good game of tennis, go trekking among the olive groves or watch the kids play in their outdoor playground. Enjoy typical Tuscan cuisine at Paggeria Medicea’s rustic inn, which offers lovely countryside views. One of our best Chianti accommodations.